SCVHistory.com | St. Francis Dam | Los Angeles Examiner, 3-15-1928. Los Angeles, California | Thursday, March 15, 1928. The St. Francis Dam collapsed at 11:57 1/2 pm on March 12, 1928. As such, due to reporting deadlines, the first reports of the disaster appeared in most evening newspaper editions in Los Angeles and elsewhere in the country on March 13. 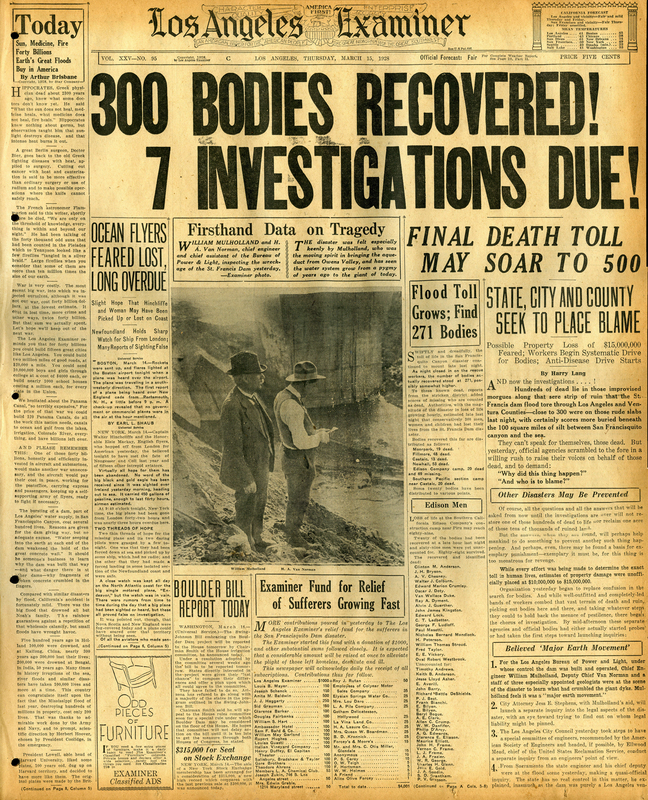 Therefore, this March 15, 1928 edition of the Los Angeles Examiner represents the third day of reporting on the dam disaster. There were multiple editions of the newspaper published on March 15, each with variations of different headlines, and each reflecting a growing death toll. At least three of the editions on March 15 contained the famous photo of Water Superintendent William Mulholland and his assistant Harvey Van Norman sadly and sullenly looking from a hillside over the tattered remains of the St. Francis Dam.